The MARS 4-Tet is one of the most engaging and exciting electric jazz groups in the mid-Atlantic. A favorite on the festival and club circuit, the Mars 4-tet is all about engaging an audience and taking them on a memorable musical journey. Combining the power and groove of rock, jam and funk, along with the sophistication and excitement of jazz, this group is not to be missed. Critics love the stellar original compositions and arrangements of the Mars 4-yet, but also point to the bands love for and reinterpretations of classic popular music including that of Led Zeppelin, Peter Gabriel, Stevie Wonder, and much more. If you are looking for fun, fierce groove, and some instrumental jazz that will appeal to absolutely every audience, you have found them… The Mars 4-Tet. 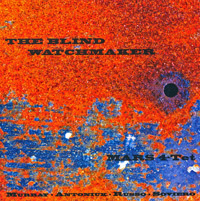 The Blind Watchmaker (Summit Records) states in no uncertain terms where jazz has been, and more importantly, where it is headed. Brazilian, European & African styles mix with swing, funk & electronics to create a new sound on the scene. Thanks to the Avalon Theatre we have some very cool videos posted. Check 'em out! We hope to see you at one of our upcoming concerts. Please check out the gigs page, as new dates are being added regularly. This ain't your grandma's jazz band.